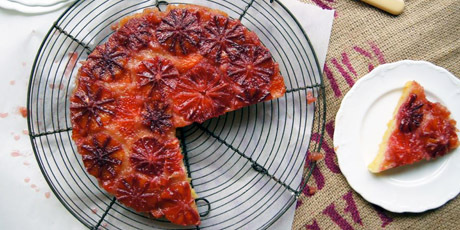 Blood oranges are a deep red variety of orange that are in season most of the year, even in winter. You can always use regular oranges or even opt for another fruit, like bananas if that’s your preference. This cake cooks quickly, is easy to make and is always a showstopper when you flip it out of the cake tin. 1. Preheat your oven to 350°F (180ºC). Start by making your caramel. Put the sugar and water in a small saucepan. Stir to dissolve the sugar and bring to a boil. Bubble until it turns a light caramel colour. 1. Working quickly, pour the caramel into a round 9-inch cake tin. Carefully place the blood orange slices on the bottom of the pan. The caramel is still hot, so be careful! 2. In a large bowl, cream together the butter and sugar until light and fluffy, about 5 minutes. Add the eggs, one at a time and mix until fully combined. Mix in the vanilla. 3. In a small bowl combine the flour, baking powder and salt. Mix in the dry ingredients and the yogurt. Mix until fully combined. 4. Place in the oven for 30-35 minutes, until the cake is cooked through and springs back when touched. As soon as the cake comes out of the oven, turn it out onto a wire rack. If you leave it, the caramel will set and it will be really difficult to turn the cake out!